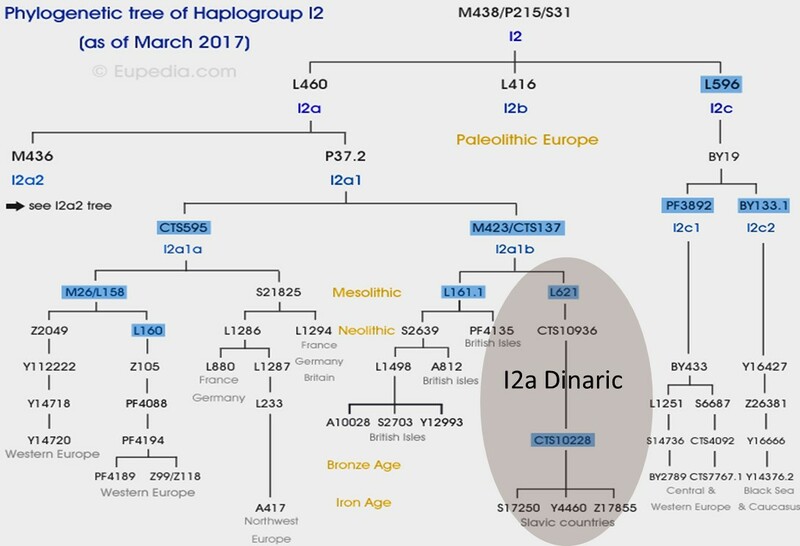 If we are talking about the peoples forming the ethnos of the Slavs, we mean two male genetic formations of YDNA: haplogroup R1a (Indo-European, Slavic) and I2-Dinaric (I2-Slavic, I2a1b according to the ISOGG classification or L621 according to SNP I- markers). Western Europe is dominated by haplogroups R1b (Eurasian, Celtic) and I1 (Nordic, northern). Western researchers have provided a lot of data about “their” haplogroups, and the R1a haplogroup research is dominated by Russian scientists. I am referring mainly to Professor A. Klosov, and by the way they are building their ethnos based on R1a, appropriating it as Russian rather than Slavic. However, the Dinaric haplogroup is neglected and there is little data available. We only have a small branch in the genetic tree of the Eupedia portal, compared to the more extensive but less numerous “western” branches. One could conclude that the haplogroup Dinaric is a insignificant small population, although in fact it is a population of 24 million men, representing almost 7% of European men and 35% of haplogroup I (I1 + I2), called proto-European or old-European. The total population of haplogroup I in the Slavic countries is almost 32 millions, which is 46% of hg I. Dinaric is the second in number haplogroup after I1, but this comparison is improper, because I1 is not as ethnically uniform as the Dinaric and should be compared haplogroups (mutations) from the same level of mutations and the same period. In this approach, the Dinaric haplogroup is an absolute leader and these genes have had a huge population success, and more precisely one founder of the family. 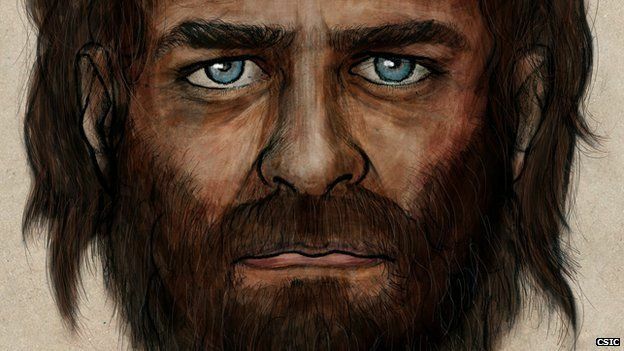 He lived in 1st millennium BC and now he has 24 millions male descendants. I called him Skyton and its symbolic image is in the sidebar on the right. The name of the Dinaric haplogroup comes from its large share in the dinaric countries like Bosnia, Croatia, Serbia, Montenegro (30-55%), with Bosnian Croats as much as 70%. Nevertheless, this name is symbolic and does not reflect reality, either as a place the origin and development of early mutations, or a large population – in these countries it is about 3 millions (13% of the Dinaric population). The high frequency of this haplogroup in this region is related to the migration (together with R1a) from the area of Central and Eastern Europe, quite late, because after the fall of the Roman Empire. The correct name should be not Dinaric but Slavic (I2-Slavic) and there is no exaggeration, because 90% of this population is the current ethnos of the Slavs created together with R1a for several thousand years. The Dinaric mutation was created in the period when men with haplogroup R1a started to appear in Europe. Dinaric haplogroup co-create the proto-Slavic ethnos. I needed the source data to perform the analysis of the Dinaric population in countries and regions. The publicly available data for statistical analysis is only on the familytreedna.com portal in the I2a Y-Haplogroup project. In November 2017 it has 2,500 members (statistical samples, although the term “accidental” is more appropriate). As for the total population of Europe (about 370 million men), there are a small number of samples and in addition from these 2500 samples, samples for the haplogroup I2a-Sardinian (974), I2a-Isles (470) and I2a-Disles (64) have to be subtracted. There are approximately 900 samples left for I2a-Dinaric / Slavic. So little, in addition, some people did not give their country of residence. Thus, the results they give may be subject to a large error. These samples are not distributed according to the number of inhabitants in each country, therefore for each country I used the factor as the number of men per sample (eg Poland 11.5 thousand per sample, Ireland 100 people per sample and the other pole Romania 200,000 per sample). In addition for analysis, it was necessary to add several other non-Slavic countries with a significant participation of Ia2-Dinarc: Germany, Italy, Austria, Albania and Greece. These studies allow to draw conclusions about the history of Dinaric hg migration and even which tribes it was associated with. In the comments, you must not use profanity, insult other people and violate the law. Comments are to be consistent with the subject of articles. The content contained in the comments can be used to modify articles or create new ones. The content contained in the articles may be copied provided that it will not be modified.